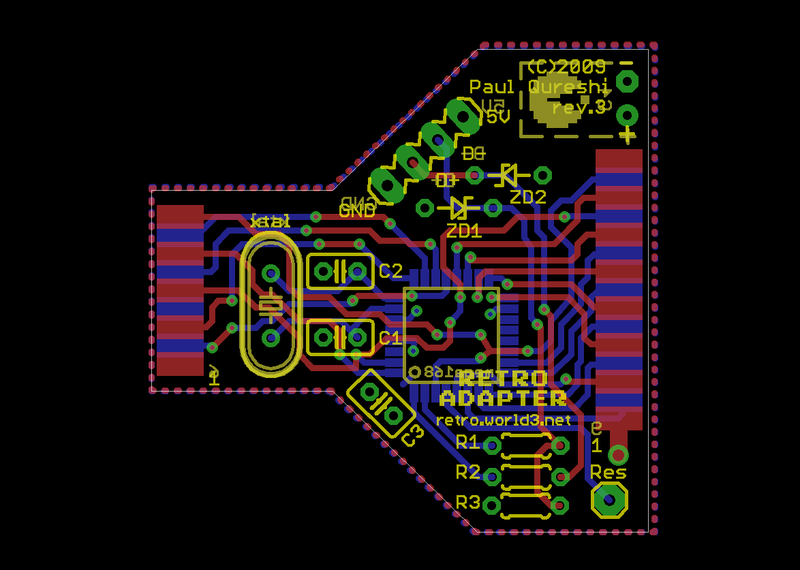 The Retro Adapter connects almost any type of game controller to USB. It works with PCs running Windows/Linux and with Apple Macs, as well as the Sony Playstation 3. 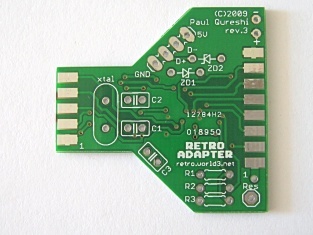 The Retro Adapter is now available to buy ready-to-go or in kit form! See the Keiō web site for details. See the old Retro Adapter page for details of the original Retro Adapter. 20.08.09 - Finally reached 1.0! After experimenting with the first prototype boards, I decided to redesign the hardware from scratch. The new design has both DB9 and DB15 connectors, and uses a more powerful AVR microcontroller with more flash memory and support for firmware upgrades over USB. Details of the old design are archived here. * I have these controllers, the others I need to aquire. Dreamcast Maple bus decoding is now working, but needs further testing. As far as I know I am the first person to achieve this on a microcontroller. The Saleae Logic logic analyser was invaluable in developing and debugging the code. I wrote a review for my blog. Many thanks to Seeed Studio for the excellent work they did on the prototype PCBs. I can recommend them for being friendly, helpful and producing excellent quality boards. * Pin 9 and pin 4 are connected to button D in Neo Geo controllers, but the Neo Geo only checks pin 4. For details of Connector pinouts see this Google Docs spreadsheet. Keep in mind that I edit it from time to time so check for updates. The PCB fits inside a DB9-DB25 converter shell, and has a DB9 at one end and a DB15 at the other. 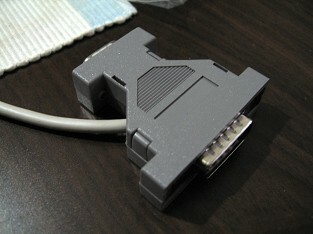 The DB9 can accept most DB9 controllers, such as Atari/Commodore style joysticks, as well as Sega Master System and Megadrive (Gensis) gamepads. 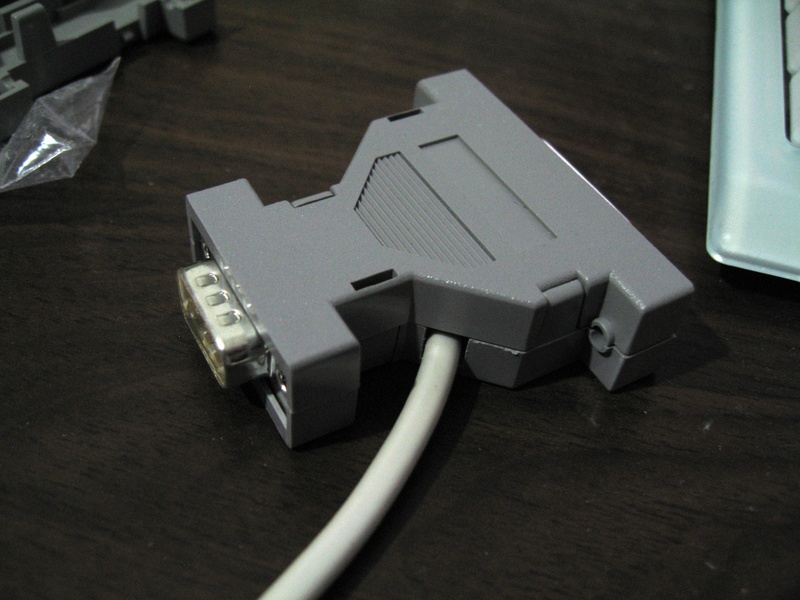 With the right connectors it can take Nintendo NES/SNES/N64/Gamecube gamepads, as well as Atari driving controllers and a few others. The DB15 on the other end can directly accept Neo Geo joysticks and gamepads. With extra connectors it can take all other supported controllers, and there is room for expansion. By grounding certain pins, the AVR automatically knows which connector is attached so everything is simply "plug in and go." The DB9-DB25 converter box is a cheap and readily available enclosure. A single hole for the USB cable needs to be drilled in one side. The USB spec mandates a captured cable, and using one also means that the position of the hole is not critical. The ATmega168 microcontroller has enough I/O ports to cover every pin on each connector, with only two being shared. The 16K flash memory is more than enough with plenty of room for expansion, and also supports bootloading for firmware upgrades over USB. The ultimate goal is to have an easy to build design which can be produced in kit form, and which is extendable for new controllers. 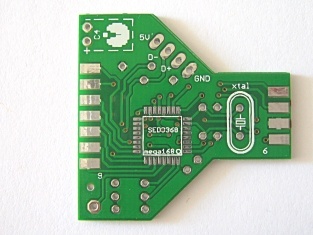 The AVR is the only surface mount component, all others are through-hole. Initial programming is done via the DB15 and a special reset test point, after which firmware can be updated via USB. The AVR's TQFP package is not too difficult to solder, but I will provide pre-soldered and programmed chips for kit builders. To connect controllers which do not use a DB9 or DB15 to the Retro Adapter a Connector is required. Connectors are mostly just wiring, but a few require extra hardware too. Since both Connectors are quite similar you can make a combined N64+Gamecube Connector. If you do, do not connect both controllers at once. Atari Paddle Connectors require a 556 timer, similar to the one used in the Atari 2600. See the schematic on the left for details. Due to the age of the controllers the paddles often jump around when in use. This can be corrected by either replacing the potentiometers (linear 1MΩ) or by opening the orginal pots and cleaning them. The 2 Player Connector gives you a second DB9. 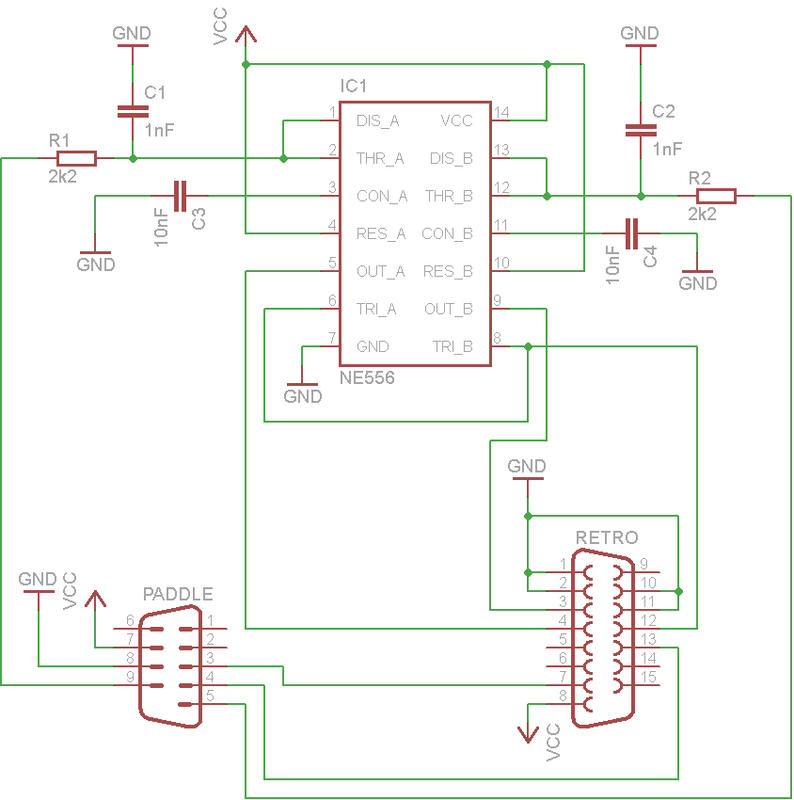 You can connect Atari/Commodore style joysticks, Sega Master System and Megadrive (Genesis) gamepads and NES/SNES Connectors to it. N64 and Gamecube support may be added at a later date. With the 2 Player Connector the Retro Adapter switches to dual joystick mode. In this mode the computer sees two separate joysticks attached, one for each player. You can then select one joystick per player in emulators. The firmware makes use of V-USB, a free open-source software only USB framework for AVR microcontrollers. In my tests compatibility is excellent and latency extremely low. Code size is also small and the design flexible. While I prefer using assembler, as I did with Igor's original implementation, C seems to be more common and will hopefully generate some community support. Assembler is used for some timing critical routines (notably N64/Gamecube and Dreamcast protocols). A bootloader provided with the V-USB framework allows updates to be loaded without the need for an AVR programmer. I re-compiled the Windows bootloader program with the correct VID/PID pair but otherwise did not modify it. Button mappings were originally decided upon by myself based on what I thought seemed logical. The idea is to have certain common buttons, such as start/select and shoulder buttons always mapped to the same buttons on the USB side. That way once buttons have been set up in a particular game or emulator, most controllers will just work with no further remapping necessary. That was the plan, until Sony scuppered it :( The Playstation 3 has it's own particular mapping scheme, and in order to have Playstation pads map correctly I have had to change my scheme entirely. At least everything will still be consistent. 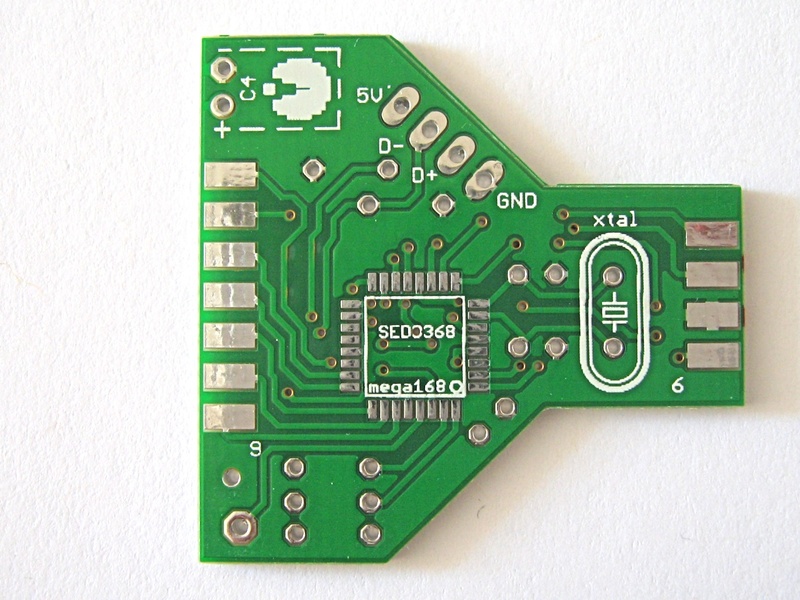 The final production PCB was manufactured by Seeed Studio. After 3 revisions, everything is perfect. 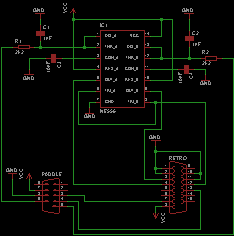 The AVR has been moved to the bottom of the board to ease the layout of the PCB tracks. I was concerned that due to some parts of the board being close to the tolerances Seeed Studio set out there might be quality issues, but after insepecting all 25 boards I received they all apear to be error free. 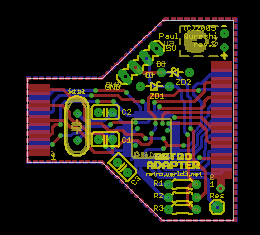 The PCB design is available in Cadsoft Eagle format in the archive below.